When life hands you the opportunity to make an album at a world-class recording studio in France, you make an album at a world-class recording studio in France. sThat was the case for long-time running Moncton act Sintax Error who made their latest record, Radical Honze, at Studio La Frette this past May. Celebrating the release of their newest album at Moncton’s Plan b Lounge this Tuesday evening, Sintax Error drummer Greg Landry says that the group made their trip overseas a working holiday of sorts. Although the album may not sound like a punk record, it is very much the punk ethos that guided the group in making their newest effort. With only 10 days to record and mix Radical Honze, it is probably best that Sintax Error used their time wisely as opposed to taking in the sights. “I can’t speak highly enough about the whole recording process. We had an incredible amount of guitars, amplifiers and equipment at our disposal which was just amazing. We completed tracking for the record in approximately four days leaving us the remainder of the time to mix the whole thing,” Greg says. The end result is a dynamic record that brings together high-energy songs offset by satirical lyrics whose music runs the gamut from punk to funk and everything in between. 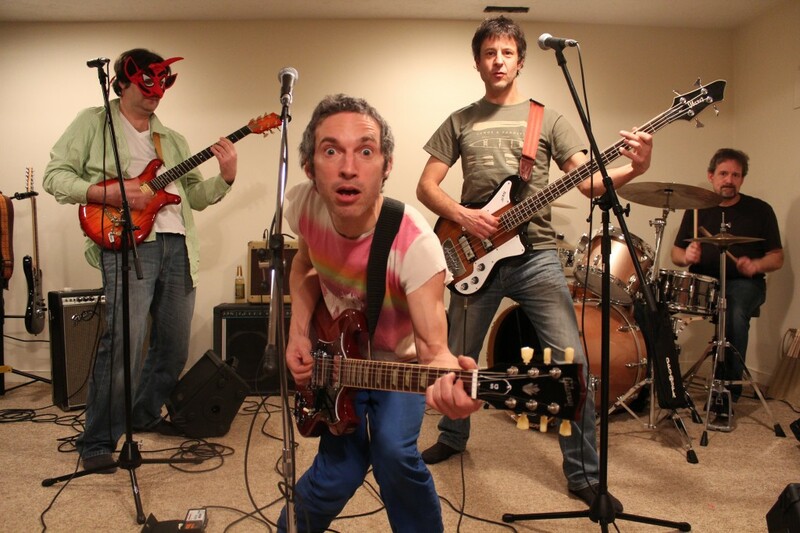 Formed in 1983, Sintax Error is arguably one of the city’s longest running bands. While there has been an ebb and flow to the music scene in Metro Moncton and Atlantic Canada over the last 20 years, Sintax Error guitarist-vocalist Jean-Pierre Morin says that the city’s music scene was virtually non-existent around the time of their formation. From 1983 through 1985, Sintax Error routinely performed in a host of Maritime cities while also venturing to Montreal where the group found a bit more of a niche for their music. The group was inadvertently put on hold after its members scattered throughout the country to acquire their university education. And while they would get back together for very sporadic reunions, the members of the band found themselves each living in Moncton once again, unable to see any reason why they should not reconvene the group on more of a regular basis. “We would play a show every six or seven years but not because we felt we had to do it. It was because we wanted to do it plus it was funny to play all those old songs we had written when we were much younger. When: Tuesday Aug. 19, 5:00 p.m.